But he got here as fast as he could. If you’re a native Texan, you know what I mean. When Debra Kristi said that Thor wanted to tour the world, I jumped at the chance to show him my little piece of Texas. 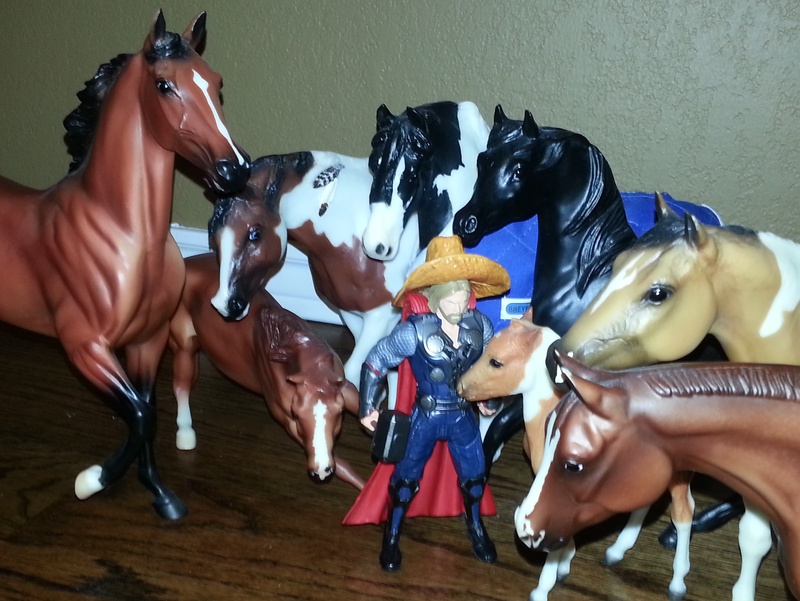 Thor thought it might be nice to have one of these steeds go home with him. The first thing he asked about was whether we had cows or horses. Uh, no. But we have this lovely collection of model horses. They were more his size than the real thing. I lent him a hat to wear, too. It wasn’t exactly a cowboy hat, but straw hats are nice. He was afraid of messing up his hair though. Real cowboys don’t worry about hat head. 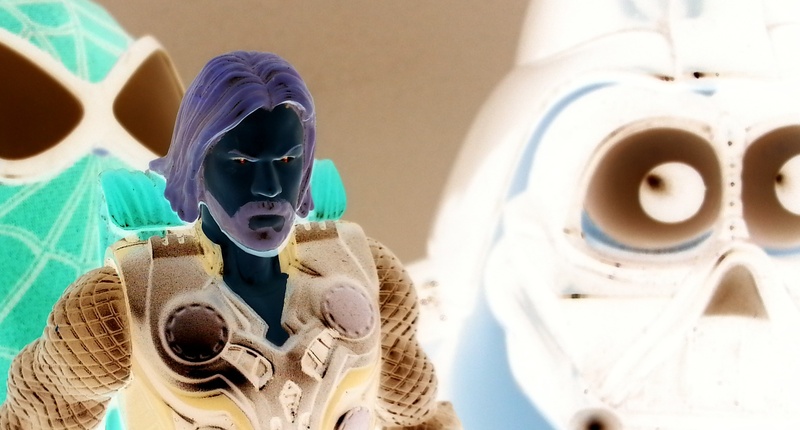 Thor found himself in some trouble with the local law. 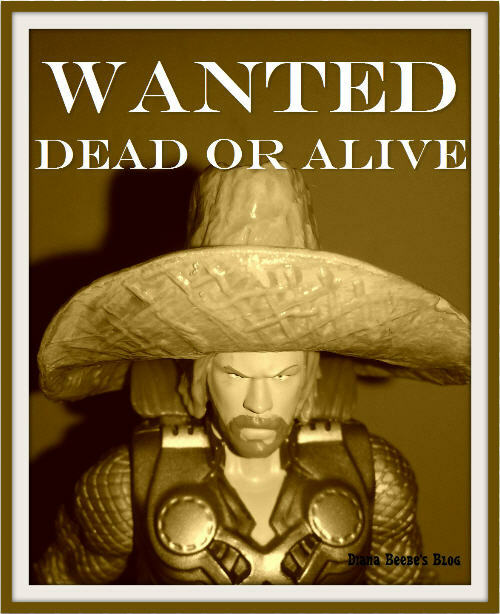 When he saw his “Wanted” poster, he knew it would be best to leave the horses at my house. Horse rustling is nasty business. 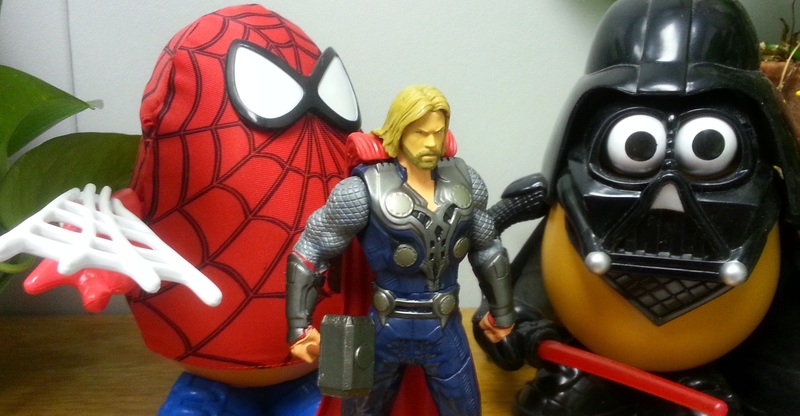 One day, I took him to work so he could hang out with Spidey-Spud and Darth Tater in my office. They showed him around my bookshelf and plants. They took turns trying to convince Thor that they could hold his hammer. They even offered up the light saber and web! Thor wondered about the potato-shaped men…. Thor, being the responsible god that he is, chose to keep his hammer to himself. Even with those eyes flashing in anger, I think he was trying to keep the spuds from embarrassing themselves when the hammer wouldn’t let them lift it. Only one has the humility and integrity to wield it. Just saying. Then he decided that he wanted potato salad for lunch. In honor of his godliness, I took him to an NBA basketball game with two of my besties (the witch and the vampire). It was the Dallas Mavericks against none other than the OKC Thunder. The god of thunder cheered his team to victory. I got worried when he complained about the OKC team’s uniforms. “How can they not include a bolt on the jerseys?” he asked. I told him that it was better than the other ones where “Thunder” was written on the back of their shorts. (Think about it.) The god of thunder was appeased when he saw so many lightning bolt shirts in the stands. He was even more pleased to hear those fans cheer when the Thunder played well. He was a bit of a stinker during the game. Everytime the home crowed chanted, “Let’s go, Mavs,” he countered with, “O – K – C!” At one point, he was so thunderously loud with threats to strike the arena that I thought one of the ushers might ask us to leave. After a nail-biting overtime, the Thunder managed to win by two points. 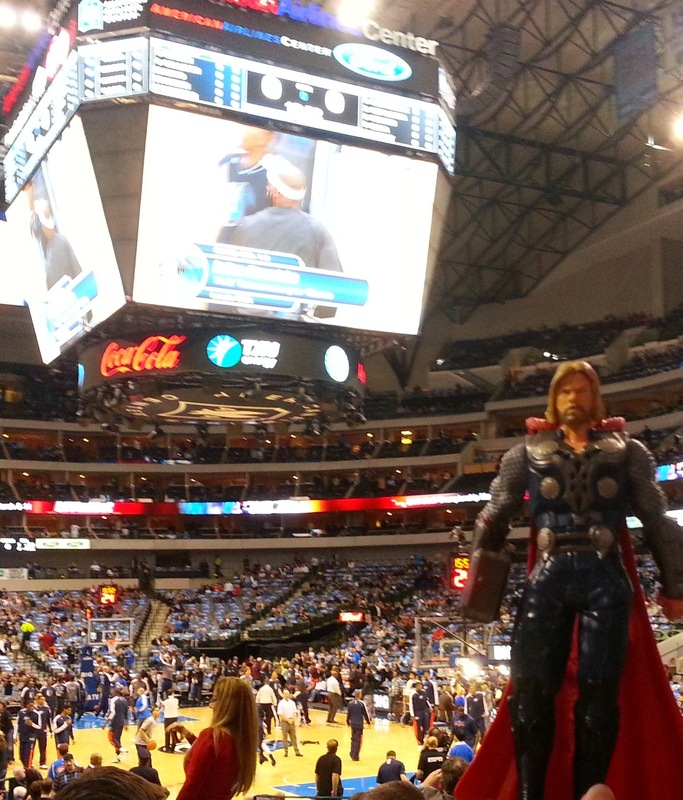 Thor claimed the victory as his own and hailed the Thunder players as the best in the NBA (they are pretty good). He taunted us on the entire drive home. No humility there. What would you do if you hosted a god or superhero? Who would it be? Come on….share!